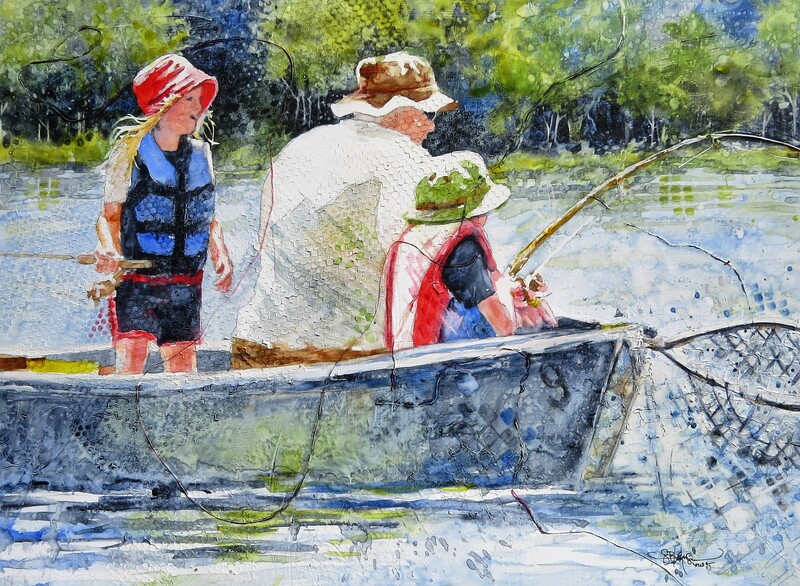 As part of my recent relationship series, the new painting, “Fishing Bug”, takes a closer look at the bond between fathers and kids. Raised on a farm in Colorado, my sister and I were not afraid to get outside and get dirty. We were outside ALL the time, it seemed. Our dad was a big part of this picture, as he has always loved working on the fields or hiking the hills. He taught us how to appreciate nature through camping, backpacking, hiking, and picnics. Every weekend during the summer, I would ask, “Can we go camping this weekend, Dad?” or, perhaps more accurately, “Daddy, can we PLLLEEEAAASSSEE go camping?”, usually while sitting on his lap, looking as sweet as I possibly could. I would pull out all the stops to get him to say yes, it was my favorite family activity. Dad always tried to make it happen, if possible. We spent days lounging at the campsite, cooking s’mores, and going for critter walks. Once in a while, we would get lucky and spot a weasel, pika, muskrat, beaver, bighorn sheep, deer, elk, or even a bear. Dad loved to sit and admire wild animals in their environment, and would involve us in his quiet observations. He gifted us with the love of nature. I have been fortunate to have the most wonderful fathers in my life: My dad, my husband, and my father-in-law. All are kind, strong, and loving, with a bonus of living life to the fullest and passing those gifts on to their children. In the joyful “Fishing Bug”, I work to express those ideas on canvas. It’s the moment of excitement when everyone in the boat realizes that, “Fish on!”, a fish has caught the lure and the fisherman is reeling to bring him in. Half-turned to us, a girl in her red hat stands up, her own fishing pole ignored and off to the side, as she giggles and shouts in happy jubilation that her sibling is wrestling in a wild beast. Dad calmly teaches the youngest child exactly what to do and how to do it. A bent rod next to a net gives us an anticipation of dinner by the young hunter. Both kids are hooked. They have caught the fishing bug. Notice string threading throughout the painting. This string signifies unity and connection between the father and his kids, and a passing on of tradition, as well as the movement of fishing line through water and air. Grids of texture reproduce net patterns, symbolizing the capture of both kid’s attention and their new love of the sport. The boat is old, not in the best shape, but no one cares. It’s all about fun and experience and time together; not material wealth or possessions. Small squares of red color from the girl’s shorts transfer her energy of the moment into the air. Her red hat tells us she lives life to the fullest, just like her dad. A dark treeline in the background give us a sense of the place, and an area to highlight the energy around her hair and further enhance this exciting moment. Sharing white of a sundrenched shirt and hat, the father and young child illustrate closeness while both of their hands are on the rod and their focus is on the goal of nabbing a fish. A number 9 smudged on the boat side tells us how many fish the crew will catch that day. “Fishing Bug” symbolizes tradition, fun, excitement, and a sharing of family values that fathers pass on to their children. Did you have special traditions your father passed on to you? Does this painting remind you of those traditions? Message me your thoughts below. I’d love to hear about them. If you are in Central Oregon in August, make sure to go check out “Fishing Bug” at Tumalo Art Company, as this painting should be seen up close and personal.